Never mind. Quite aside from these biographical details, I’m always on the lookout for interesting white rums, and so made it a point to check out the Prata just to see how well it fared. Which was, for a 42% rested-but-not-aged pot still rum, not shabby at all, if not quite as feral or in-your-face as some of the French island blancs, or, for that matter, the clairins. In fact, nosing it, the Prata presented as a rather genteel variation of such more elemental whites, and for that reason may actually be preferred by people who are put off excessive expressions of crazy and are more middle of the road. It was redolent of sugar cane juice freshly pressed, oily, briny and with some olive action in the background, but also herbal notes of dill and a little sage, some faint rubber hints, and subtle acetone and florals rounding out the profile. The palate was not overly aggressive – at that strength it would have been surprising if it had been – and while quite dry, it reminded me somewhat of the unaged column still clairins, just gentler. It was warm, sweet, and almost delicate, and also contained some of Neisson’s tequila and briny notes. Sugar water (and that’s white sugar, by the way), more dill, sage, rosemary and a little cinnamon, but what distinguished it after a few minutes was an unique (for cachacas) taste of musty earth and wet tropical vegetation that bordered on the funkiness of a Jamaican without ever actually being so. The mouthfeel was rather light, warm and relatively smooth, so certainly the initial cuts and the resting period had their impact. As for the finish, nothing original there – just warm, aromatic sweet spices, and a vague mustiness that was far from unpleasant and made the rum stand out in its own way. 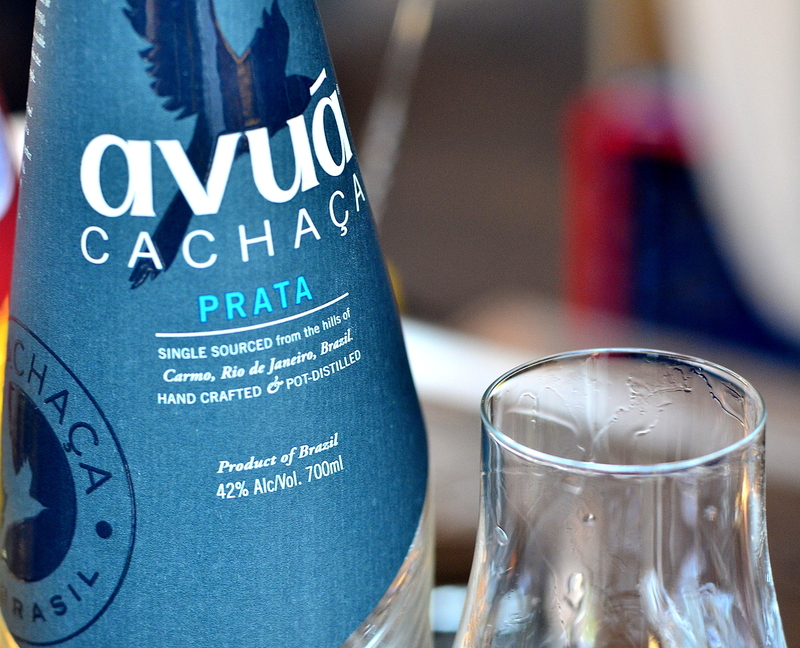 As a white rum the Prata cachaça carves out some interesting territory for itself: it’s not so crude and jagged as to be off-putting to the greater public; its tastes are pleasant, yet distinct enough not to be confused with other whites; and overall, one weakness (much like the Toucan No. 4) is that for the complexity that it does exhibit, it could easily be stronger and lose no adherents. One is left with rather more titillating sensations and vague sensory memories than an explicit and clear-cut profile, and it showcases emergent potential rather than a solid current achievement. It’s interesting to note that the company is now also producing a Still Strength version (45%) to maybe address precisely this issue, and if they are doing that, we should be keeping an eye out for what else they’re doing in the next few years. Because if they ever have the bolas to issue this white rum’s same profile at 50% or greater, I’d probably grin, take a deep breath, and dive right in. The other day I read that there are supposedly forty thousand cachaça producers in Brazil ¹ — if that statistic is actually true, then most are probably from small ops like the 500+ or so in Haiti – backyard moonshineries, rather than medium to large commercial operations. But there is no doubting that they represent a significant slice of the global volume of cane-derived spirits and it’s too bad that so few reviews of them exist (perhaps the lack of exports is to blame – most is drunk in-country; or maybe we need some Brazilian spirits bloggers). A major characteristic of cachaças, when aged, is the resting in barrels made of local hardwoods. That peculiarity of local ageing is, to me, rather crucial when it comes to distinguishing an aged cachaca from any other rum. It’s what makes aged cachaças unique — most of us are so used to our hooch being decanted from ex-bourbon barrels, that to address a Brazilian rum for the first time can come over as a startling experience (note – I am using the term rum and cachaça interchangeably). 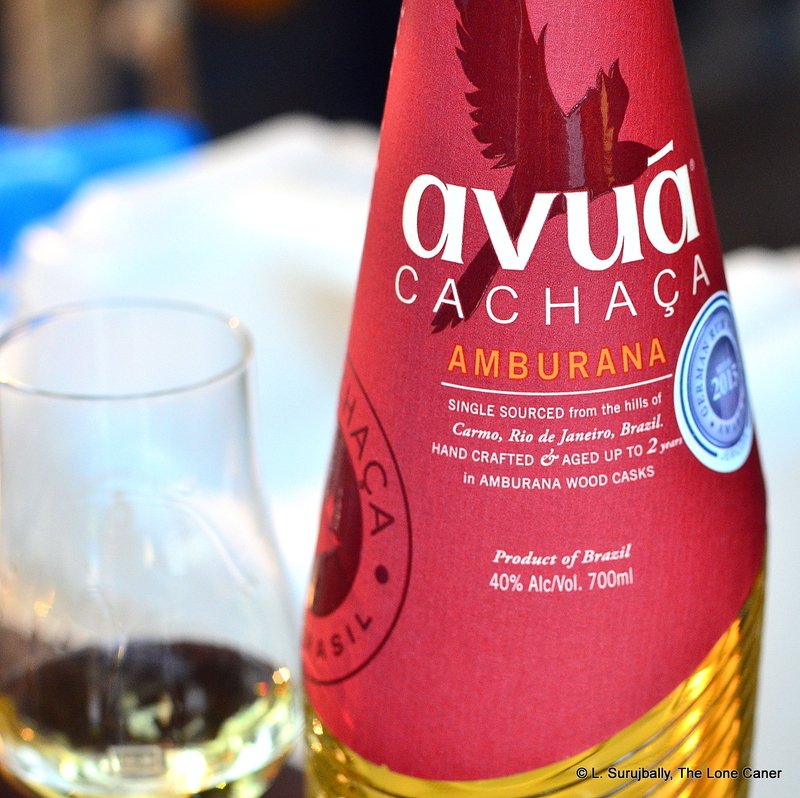 Take for example the Cachaça Avuá Amburana, made by Fazenda da Quinta, a small 3rd generation outfit founded in 1923, located just outside Rio de Janeiro. 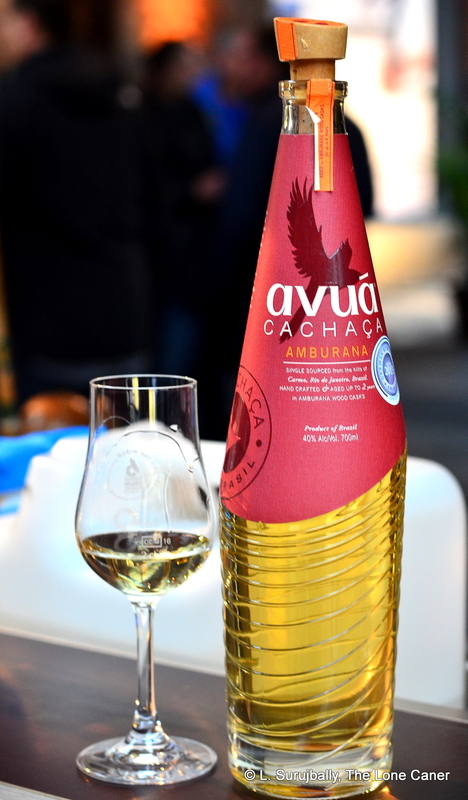 Their cachaça is made from two types of sugar cane, has a 24 hours fermentation period, and is pot still distilled. As the name implies, it is aged in barrels made of amburana wood (which supposedly imparts an intense colour and flavours of sweetish vanilla) for up to two years and is bottled at 40%. Does the amburana make for a uniquely different taste profile? Yes and no. It certainly presented aspects that were similar to young agricoles – fresh and crisp aromas of watery pears, sugar cane sap, swank and watermelon just to start with, clear without real sharpness. It’s after opening up for a few minutes that it shows its antecedents more clearly, because other smells, somewhat more unusual, begin to emerge – cinnamon, nutmeg, bitter chocolate, sawn lumber, wet sawdust, freshly baked dark bread. Not your standard fare by any means. The palate was quite firm for a 40% rum, stopping just short of sharp and marrying complexity with a variety of flavours in decent balance with each other. It had both red wine and muskier whisky notes, and bags of the aforementioned spices – cinnamon and nutmeg. Vanilla, ginger, sugar water, gherkins, cucumbers, a sharp cheddar, sawdust…and also a weird line of sweet bubble gum. And, of course, some herbal grassiness – but overall the defining taste was mostly the cinnamon and swank with that slight bitter background. This continued smoothly into a longish finish that again brought out the bubble gum, some Sprite (or 7-Up, take your pick), faint citrus, more cinnamon and vanilla, and a bit of sugar cane sap. A little dry, overall, but pleasingly complex and tasty for all that. I just wish it had been bumped up in proof a few notches – at ~45% it might just be amazing. Tasting the Avuá Amburana blind, without some experience or comparators around, you’d be hard pressed to identify the country of origin (though the slight bitterness, woodsy taste and cinnamon background would likely give it away), and might even confuse it with an agricole – probably to the displeasure of any Brazilian. Be that as it may, I quite liked it, and since its introduction in 2013 it’s made a quiet splash in North America, as well as winning awards in 2015 (Berlin Rumfest) and 2016 (Madrid Congreso del Ron). 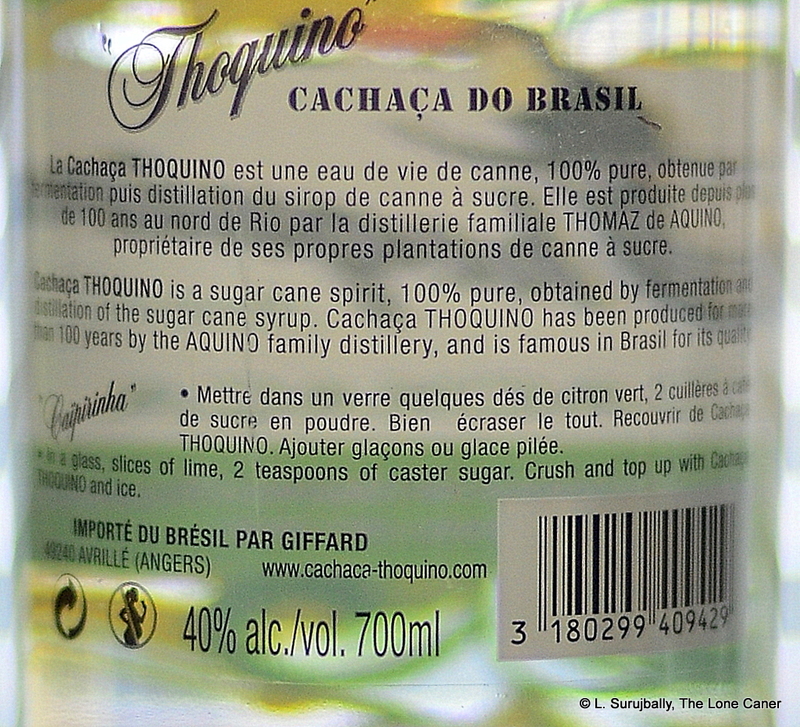 Brazilians involved in the production of cachaças are at pains to distinguish them from agricoles, but any casual rum aficionado would have some difficulty following the logic – after all, both derive from cane juice, distilled on either pot or column stills, the cane juice has a short fermentation time and is processed soon after harvesting. 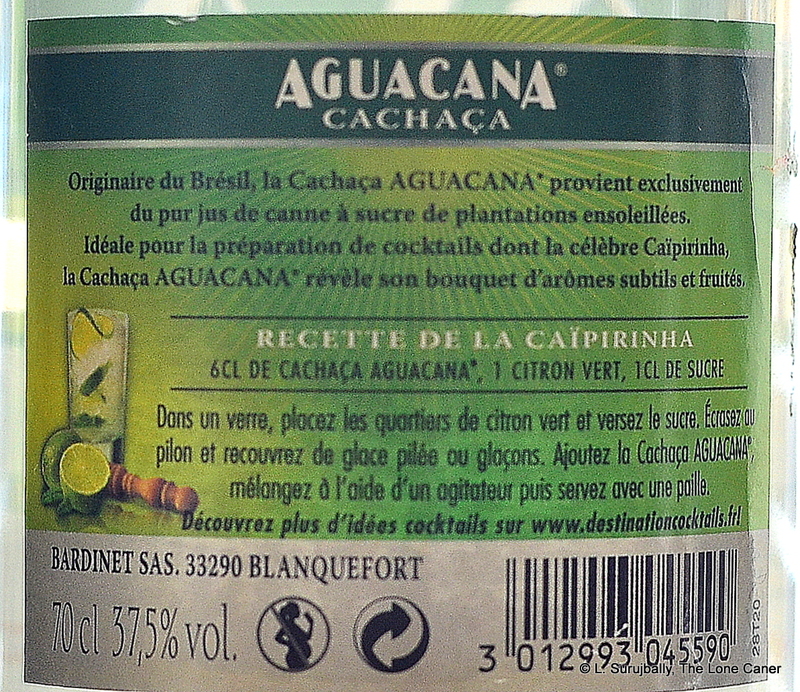 Regulations are specific to each region: for example, a cachaça can only be called so if it derives from Brazil and at least 50% of the blend is aged for a minimum of one year, and for me that’s a naming and production convention and not a serious departure from agricoles (to use another example, calling only a rum made in Guyana a “Demerara” does not make it any less of a rum). Also, as briefly noted above and more applicable to Brazil, a cachaça can (but does not have to) be aged in local woods like jequabita, amburana, carvalho etc, and not the more “traditional” oak barrels like ex-bourbon, ex-cognac, limousin oak, and so on – however, since the type of wood of the ageing barrel is not a disqualifier for any rum or ron or rhum anywhere in the world (except perhaps Cuba), this again seems more a local peculiarity, not a fundamental difference between the two types of rum. So in other words, given the cane juice origin, then either cachaça is a Brazilian agricole, or agricoles are French cachaças. To me such distinctions are geographical, not fundamental. Irrespective of the pride that the producing countries bring to their indigenous rums, production philosophies and heritage, both have interesting products that are cool to drink and make killer cocktails. That the French island rhums currently get more good press than cachaças do is no reason to ignore the latter – taken with their uniqueness and taste and wide applicabilty, something like the Avuá Amburana is good to experience if you want to go a little off the beaten track without heading into the jungle altogether. 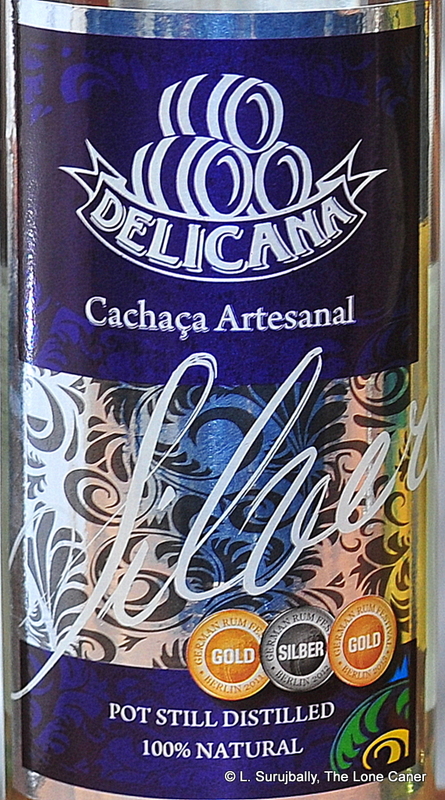 It’s a pretty nifty cachaça that’s well worth checking out. Ralfy gave the Avua an in-depth look on his video in May 2017. Matt Pietrek, the Cocktail Wonk, used this rum to provide an introduction to cachaças, back in 2015. It’s also got some good historical notes on the founders. Novo Fogo is the first cachaça I’ve ever tried that went off the reservation and hammered me in the face even at a relatively staid 40%. It was so different from the regular run of sugar-water-plus-local-wood flavours to which I had become accustomed in my (as yet) brief acquaintanceship with the Brazilian national spirit, that I literally pulled my face back from the glass, muttered a disbelieving “wtf?” and spent another five minutes closely perusing the label to make sure I had not been taken for a ride. But no, it had been an unopened bottle, it had some tasting notes on the label not a million miles removed from what I was sensing, and it all seemed quite legit…except that it was about as subtle as a bitchslap from Ser Gregor Clegane on a bad hair day. And I mean that in a good way. 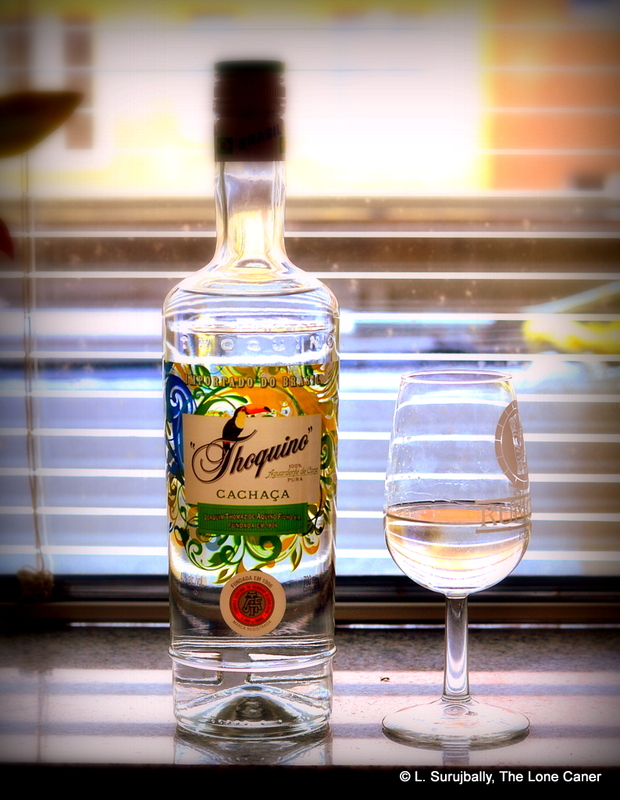 The producer of this interesting cachaça is a company called Agroecologia Marumbi SA, from Morretes PR (Parana) which is located in the south of Brazil, not Minas Gerais where supposedly the best and most traditional cachacas are made. 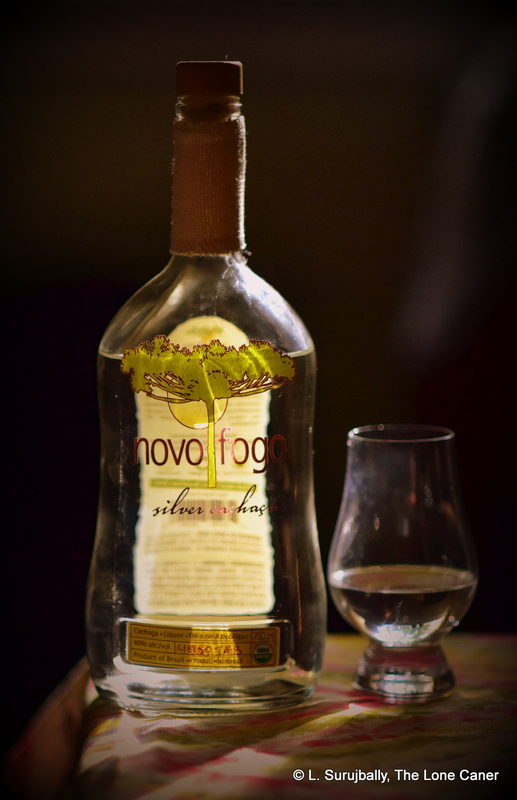 Novo Fogo (“New Fire” in Portuguese) is derived from sugar cane grown without herbicides or pesticides, and the organic nature of the operations is a major point of pride and quality, according to the distillery founder Fulgencio Viruel who started the operation in 2004. The cane is manually harvested and taken to an onsite press that extracts the pure juice, with the leftover bagasse recycled as fuel and fertilizer. Fermentation takes around 24 hours using wild yeast and the 7%-9% wine is then passed through a copper pot still (another point of departure, since most of the well known cachacas are done on column stills), and then rested – not aged – for one year in a stainless steel vat before being bottled without any filtration or additions. So there. Aged variations exist, but I didn’t get a chance to try any. Given the impact this one had on me, I should really try some more. I say impact not so much because of great beauty of construction or masterful subtlety of assembly, but because the thing is startlingly good for a standard strength Brazilian table tipple, if perhaps somewhat at right angles to others I had tried before – it’s something like a concussive Delicana’s Jequitiba, or an amped-up Thoquino. Nothing demonstrated this more clearly than the initial nose (the very first note in my battered notebook was “Damn – this thing is serious!”) where I immediately sensed an intense vegetal aroma of rotting fruits, bananas, overripe red wiri-wiri peppers in vinegar (but without the heat). It was followed up by strong, distinct brine and olives, salt, wax, sugar cane sap and lemon zest, and frankly, what it reminded me more than anything else was a Clairin Sajous, if perhaps not as powerful. Thankfully it did not sample as sharp as the aroma suggested and that might make it somewhat more approachable than those who took flight from the Sajous and its cousins (assuming one’s tastes bend that way, mind you – and that’s not a given). It was quite heated, firm and crisp, rather rich and solid, with a more characteristic sugar water taste coming forward now, not entirely displacing the wax and salt and olives which persisted quite strongly (along with the peppers). More lemon zest was here, some black pepper, apples, vegetals and some fleshy fruit like overripe pineapples. The balance was a bit off – the brine and olives never really let go, which made the fruitiness recede somewhat and reduced my enjoyment, but overall it was a pretty good cachaça — if one keeps in mind my predilection for clairins, which this one closely resembled. Finally, it closed off, rapidly, leaving behind nothing much more than the memories of swank, fresh mown grass and that lemon-pepper salt which my wife complains I overuse in what little cooking I can be persuaded to do. Now, I’ve read online notes that talk about the easy entry, how it is smooth and soft, and then wax rhapsodic about its various competing flavours (the last of which I believe), but I stand here telling you that it’s not really as easy as all that: this thing is a dirty, off-kilter little dragon that seems to be just waiting for an opportunity to jump down your throat and toast your chest to medium-rare – but it’ll do it with finesse, with some style. It’s quite a fire-breathing, smoke-exhaling cachaça, and is in my limited experience the most original and interesting spirit of that kind I have tried to date. Admittedly I have an obnoxious love for obscure and powerful tastes that borders on the masochistic, so I liked the fact that here there was a rum — charged-up, drinkable, original and in its own way, quite remarkable — made in that same vein. It’s worth trying it, I believe, just to see where the whole experience goes, to spend a lot of time figuring out…and, perhaps, just perhaps, to savour. This review is quite late to the party since Novo Fogo has been available in the States for years (the first review I found dates back to 2011). And, as ever one step ahead of me, Josh Miller at Inuakena had run it through his 14-sample Cachaça Challenge back in early 2015 and rated it….wait for it…as his #1. Background information is as skimpy as the taste profile. The rum is made under the auspices of Bardinet, a French spirits company founded back in the 1850s by Paul Bardinet who worked on blending and taming sugar cane alcohol that was shipped to France. These days the name Bardinet (with respect to rums) is probably better associated with the Negrita and Old Nick brands, but since 1993 they have been the La Martiniquaise-Bardinet Group and control Dillon, Depaz and Sainte-Marie on Martinique, as well as Distillerie de Marie Galante and SIS in Guadeloupe. So certainly their lineup has real heft in it. As for the Aguacana, it’s one of the many brands within the group and that’s about all I could dig up – I don’t even know where specifically in Brazil it’s made. From the paucity of the information and lack of any kind of serious marketing, I get the impression it’s an afterthought meant to round out the portfolio rather than a serious attempt to make a commercial statement or break the Brazilian market. Let’s get right into the tasting. The nose is sharper and clearer than the Thoquino that was tried alongside it, herbal and grassy, demonstrating more salt and less sugar, some vague florals and unripe green grapes so in that sense it was different. The problem was (and remains) that that was pretty much the whole shooting match: if there were more undiscovered aromas, they were far too faint and watery for me to pick them out. Slight improvement on the palate. It presented a clean and spicy-sharp alcohol taste, quite dry, and was weak and near ghost-like at everything else – one senses there’s something there, but never entirely comes to grips with anything. So I let it rest, came back to it over a period of hours and noted tastes of iodine, watermelon, cucumbers in vinegar, flowers, and the ever-present sweet sugar water that so far has been a characteristic of every cachaça I’ve ever tried. Overall it was watery in the extreme, and even though sometimes ageing in oddly-named Brazilian woods imparts some off-base flavours to the profile, here there was none of that at all. “Slightly flavoured water” is what I remember grumbling to myself, before also noting that the finish was “inconsequential, with no aspects of profile worth mentioning that haven’t already been sunk by the mildness” (yes, my notes really do read like that). Perhaps it’s unfair to judge a drink that is not meant to be anything but a cocktail ingredient as a neat sipping spirit, and you’d be within your rights to make the criticism. Still, you have to know what it’s like on its own before you go making a mix, right? How else are you going to know what to add? In fine, the Aguacana is a meek and inoffensive and ineffective cachaça, which does the job of making a shy caipirinha easy enough since just about anything added to the glass would alter the profile to what is desired (which may be the point). The relaxation and the buzz will arrive eventually, but if you really want a sense of what the rum is like by itself, you’ll spend a long time waiting for any kind of flavour to chug into the station. And as for me, I’ve got better rums to try, so I’ll pass on this in the future unless Mrs. Caner feels generous enough to whip up a drink for me. 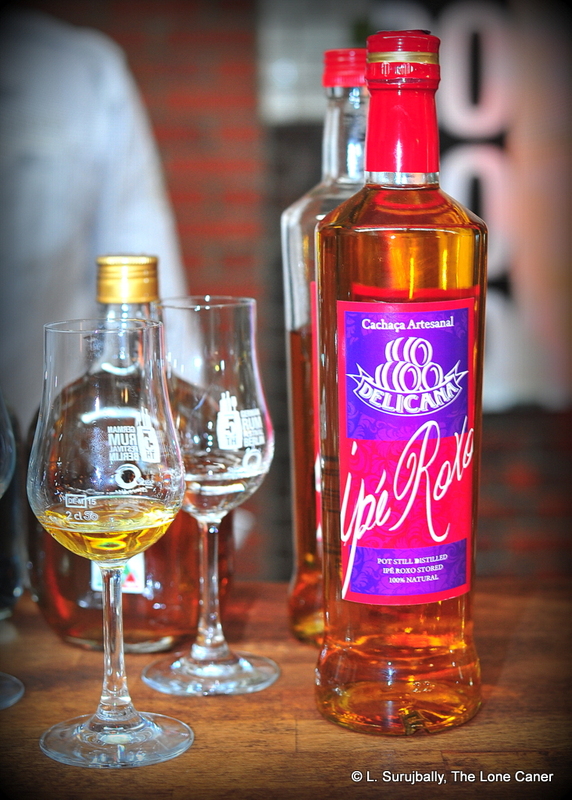 Cachaças are, as any rum pundit is aware, those cane juice based rums that are not called agricoles because they are made in Brazil rather than the French Caribbean islands. Geography aside, they have two major points of difference – one, they are often age in Brazilian woods of one kind or another, and two, those that are available outside Brazil are almost all made to be mixed in a caipirinha, not to be had neat. I’ve heard that over a thousand varieties made domestically, and the best of them are sold only there, and many top end aged variations exist… unfortunately few, if any, are ever exported, which creates the illusion that they are low end rums as a whole, and to this day they take second place to aged agricoles. Which is a shame, really, for it denies the rum world of potentially world beating products. 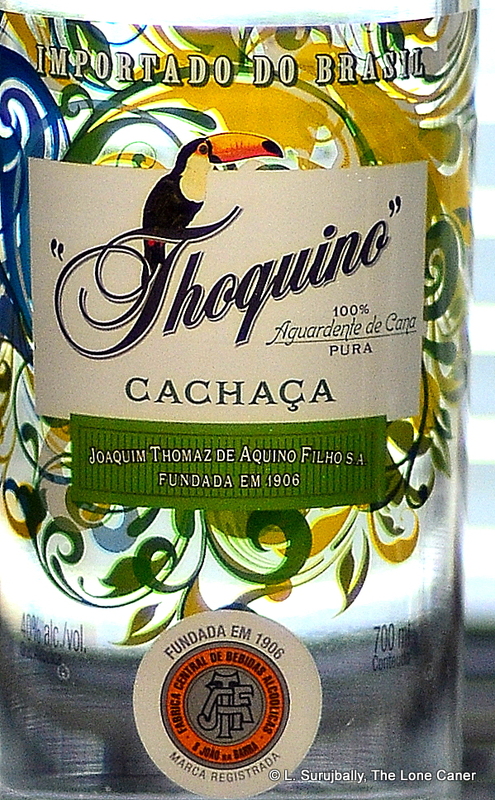 Thoquino is a company formed in 1906 by Thomaz de Aquino, and is located in Sao Joao de Barra, the Campos area just north of Rio de Janeiro, where sugar cane cultivation goes back to the earliest colonization of Brazil in the 16th century and which is considered the “traditional” area from which the best cachaças originate. The company has its own sugar cane fields, which apparently is somewhat unusual for a Brazilian distilling company, and which allows it to control and integrate the entire process from cultivation to the final product, in-house. The spirit derives from fresh pressed cane juice which is fermented for an unusually long eight days, and then double distilled (I suspected it is filtered as well); there is no information available on any ageing, and since normally both age and the wood in the barrels is proudly trumpeted to the heavens, I’d suggest this is a zero year old. No information on stills is available. Having written all the above, how’s the rum? Well, nosing the clear 40% spirit made it clear that it stemmed from the same family tree as the Haitian clairins and the Capo Verde grog, if not quite as raw or brutal aggressive; and I formed the sneaking (if entirely personal and unconfirmed) suspicion that it hailed from a creole coffey still. It smelled sweet, yes, with black pepper, oil and brine in there somewhere (sort of tequila-like but with less salt), sharp and uncompromising as a zealot’s hot glare. Over time it turned vegetal, with more pronounced aromas of sugar water, citrus and (get this!) cinnamon rolls hot from the oven. The taste was initially quite lovely, rolling light and sweet and (relatively) smooth across the tongue. It wasn’t complex in any way, but it was pleasing in its own understated fashion. There were some flowers and fleshy fruits — pineapple, bananas — in an uneasy mix with sharper pepper and citrus rind, sort of held together by the vegetal sugar water, and in the background there lurked the toned-down notes of olives and brine, held under tight control, leading to a short, sweet, light and overall unexceptional fade. As tasting notes went, the cachaça more or less confirmed its antecedents without trying to break the mould. Since it was advertised and marketed specifically as a caipirinha agent, perhaps it would be churlish expect a top end spirit here, and indeed, the company does make an aged version (aged in Jetiquiba wood) which I have not tried. So all in all, a straightforward mixing agent then. Still, maybe it’s time for some enterprising rum maker to take a plunge and start promoting the best of the cachaças in the western markets. Not the good quality young stuff, but the really amazing rums which only Brazilians are aware and which remain unknown to the majority. Bert Ostermann of the German company Delicana has tried with limited success to do so, some independent bottlers like L’Espirit have issued the occasional aged bottle, and we need more. Although the Thoquino and others I’ve tried may not quite be there (yet), we should keep an eye on Brazil in the years to come, for their rums point the way to another facet of the ever changing rumiverse. If Luca ever decides to go there, watch out. 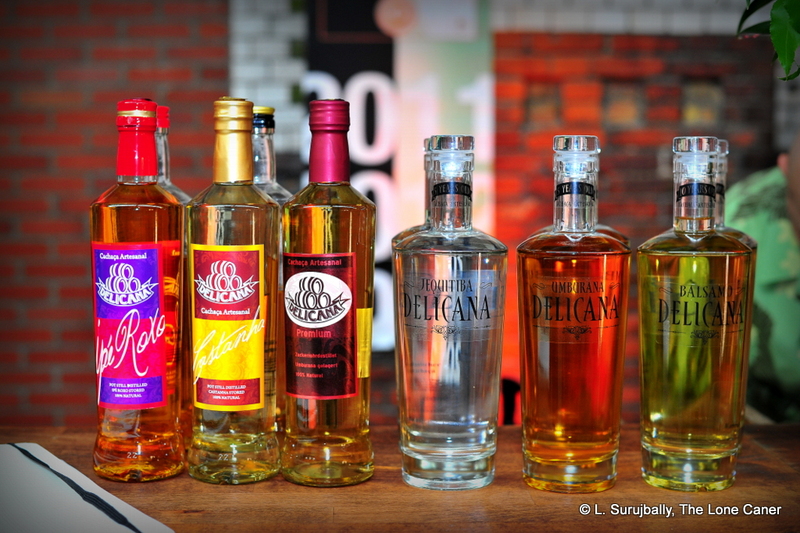 In 2014 I looked at three very different aged cachaças from Delicana, the German maker of Brazilian rums; I had met the owner, Bert Ostermann, who has had a love affair with the country lasting many years at the Berlin Rumfest and we had a long and pleasant conversation. The central theme of his work was to age his rums in local woods, which gave them a piquant, off-base profile that at the time I didn’t care for – indeed, I scored the youngest of these rums the best, because I felt that the peculiar tastes of the wood had not had time to totally dominate the rum. A year later I made it a point to stop by his booth again, and retasted all three which were back on display, and comparing my written notes, I find very little difference, either in the tastes, or my own opinions – the wood is just too different, and perhaps I’m not in tune enough to appreciate them the way a Brazilian might. Nose: Very agricole like, starting off with salt and wax before becoming vegetal and grassy, dusted lightly with cinnamon and something spicier, like (no kidding) quinine. Palate: Smooth and easy, lots more red olives and tomatoes, cucumbers freshly sliced, mown grass, a few unripe white guavas….and a bit of dill. Tart on the mouth, quite nice. Thoughts: Slightly better than the older Castanha (Bert is going to shake his head at me, again); I attribute that mostly to better balance in the flavours, and the lemon was really well integrated with both wood and herbals. 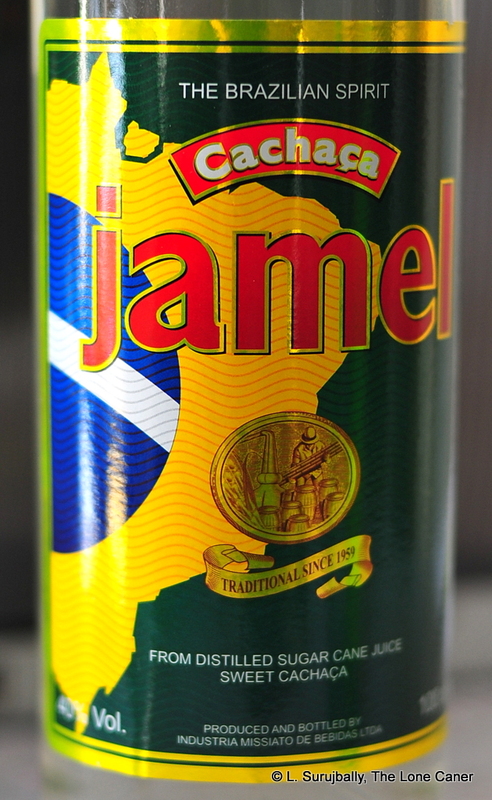 Palate: Like the Jamel, it did a one-eighty degree turn. Thin and watery cucumbers in brine, vague vanillins, white sugar dissolved in extremely diluted lemon juice, a tad oily in mouthfeel, some sweet baking spices in there, cinnamon and nutmeg, too light to really be noticeable, but all serve to tame the nose. None of these rums is new, and two have won prizes, so it’s not as if Bert spent the last year refining his output, tweaking his ageing regimen and changing his barrels in any way. But these are all younger than the ones I tried back in 2014 and I liked them more – they were lighter and cleaner in some way, integrated their tastes better, and the influence of the woods was held in check in a way that allowed more diffident flavours to come through. I wonder if that will turn out to be a characteristic of the type, that the ones under five years old will be the better ones. The journey continues. Original enough to make it worth buying just to experience it. Nose is startling, taste a lot better. In trying the Jamel, Leblon and Sagatiba cachaças together this one stood out quite markedly, even more so when ranked against the German company Delicana’s three local-wood-aged variants that I’ve also tried. The L’Esprit Brazilian rum might have set the bar high and remains the one I prefer the most (so far) but if you stick with it, this one is pretty damned good too…and this is one of those times that if they did add something in, it was probably the right decision to make for anyone who has the courage to take cachaças neat. What it also does is showcase some of the divergences of these rums from the norm, which goes a far way explaining the lack of acceptance of cachaças worldwide. The unaged white 40% rum is made by Indústria Missiato de Bebidas Ltda formed in 1958 in Santa Rita do Passa Quatro (in the state of Sao Paolo). Armando Missiato and his brothers started the ball rolling by being general spirits merchants in wholesale and retail, and in 1961 diversified to producing their own cachaça (the “61”). The success allowed the company to build a modernized plant in the 1970s and they have gone the route of major liquor local companies in other countries, producing a number of spirits (including vodkas, energy drinks and cachaças). Unsurprisingly, little of this ever emerged to trouble the minds of rummies anywhere outside the country and likely they are still best known in Brazil. The company continues to be held and run as a family business, and has expanded not only into other states of the country, but to the North and South American, and European, export market. So, moving on, I said it was a pretty nifty drink and wasn’t joking…but one has to stick with it, and at the end, when jotting down all the notes, I realized it had become a lot more enjoyable out of sheer perseverance. Take the nose, for example – it had the heated, tart, spicy, almost-sweetness of apple cider with a few overripe apples still inside, plus brine, wax, and nuts. Unimpressed, I put it aside to work on the others, yet ten minutes later, perhaps in violation of the laws of the rum universe, it actually smelled worse – it moved to rotting vegetation in humid tropical rain, dead leaves, wet cardboard and (I shudder at the memory), yes, wet dog. There was some rubber and other phenolic stuff rounding things off, but let’s just say it did nothing to impress me and I wondered whether I had made a mistake jumping into this jungle of undiscovered rums…right up to the point where I actually tasted it. Wow! Where did all the unpleasantness go? This was like an utterly different rum. Warm, a little spicy and a shade less than medium bodied, it was an altogether remarkable turnaround. Sugar water, light and sweet with citrus peel, crisp white-fruit notes, it was sparkling and clear and joyously young. There were some faint ashy textures to it which were in no way excessive (a hint was all), melding well into a sort of easy creaminess of a delicately flavoured yoghurt, with an emphatic exclamation point of wood and smoke closing it off. It was sprightly, it was a little off-kilter, but miles better than the initial entrance had suggested. Even on the finish this odd quality persisted, giving up individual points of swank, some weird tree-sap (reminiscent of dripping capadullah vines and the Rum Nation pot still white Jamaican), and a last flirt of sweet lemon pop. Overall, nose aside, it was quite a pleasing drink to have on its own. Key to my emergent appreciation was the fact that taste-wise it didn’t go wildly off on a tangent, and some effort appeared to have been made to ensure its appeal to a broader, maybe more international, consumer base by tamping down the wilder olfactory excesses of cheerful Brazilian energy, while losing little of the character that makes it distinctive. So far, my sojourn into the Amazon has been too brief, and not provided the excellence I’m sure lurks under their green canopy. But this cachaça suggests the potential, and convinces me that bigger, better, bolder and badder is is out there, somewhere. I just have to keep trying, and the Jamel points the way. The label, miles away from the cool modernist detachment of the Leblon or Sagatiba, channeling some of the bright power of Milhazes or Carybé, does raise a question – why is it termed a “sweet” cachaça? Under Brazilian law sugar can be added to cachaças, and I have no particular beef with it one way or the other (as long as it is disclosed), it’s just that there is no such notation either on this label, or the website. So I make mention of it for the curious, but will leave it there. Great nose. Taste and finish don’t quite measure up. 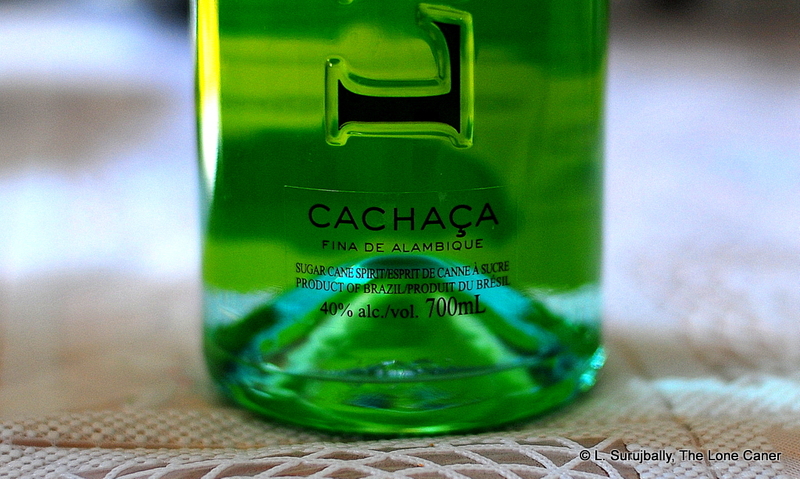 This was a cachaça I bought back in 2011 or thereabouts, and never bothered to open and review because I had zero experience with the spirit beyond getting smacked on caipirinhas a few times; I lacked sufficient background to rate it properly and it seemed to be unfair to score it when there were no fitting comparators. Several years on, nearly three hundred reviews and quite a few Brazilian spirits later, plus available comparators and controls, and I felt better equipped to write something I can put my name behind. Sagatiba Pura is produced in the small town of Patrocinio Paulista in the state of São Paolo, Brazil. The company was formed in 2004, and through adroit marketing and what must have been pretty good brand ambassadorship, became one of the first cachaças to be widely exported and known outside its country of origin (it claimed to hold a 90% market share of cachaças in Britain in 2007). It was likely this exposure that caused Campari to buy it in 2011 for $26 million. The company also makes Velha and Preciosa variations, which are aged and brown rhums in their own right, unlike this clear one, which was (and remains as of this writing) the only one of the line to make it to Canada. Too, while the USA appears to have gotten the 38% ABV version introduced back in 2013, mine was 40%. The clear, multi-distilled, unaged cachaça had a nose that was by far the best of the series I tried that day, and though it came from a column still, did a good imitation of being a pot still product. Rich, briny, waxy and redolent of spanish olives with splash of furniture polish, it also had some hints of woodiness lurking in the background (though of course it had not been aged). What made it shine in my estimation was the way it developed – after standing for a few minutes – and started to provide smells of citrus peel, crushed sugar cane, a sweetish amalgam of cinnamon and nutmeg, and even the light perfume of flowers…a really nice aroma all round, light and clean. It was too bad that this promise didn’t carry over as to how it tasted. It was spicy, clear, clean and dry, not sweet at all, with (initially) little of the delicate perfume the nose suggested. There was a certain metallic taste to it, a mixture of tobacco and wet campfire ashes, almost mineral-y in nature, sufficiently aggressive to squash the lighter vegetals, wet grass, aromatic cigarillos, sugar water, florals, watermelon and sliced pears which came out (helped by some water). These clashing flavours did not, in my estimation, play well together. Exactly the same notes carried over into the fade, which was short and dry and warm and smooth enough, but still ruined by the ashy and smoky, background, which was far too dominant and all-encompassing for me to appreciate it. There was originality here, no doubt, but no adherence to one taste profile over the other – like gambolling puppies they were all allowed to do pretty much what they pleased, without discipline or imposed order. It’s curious that the Sagatiba is marketed as some kind of premium top end cachaça – it sure doesn’t taste like one, though it is better than the Leblon I tried alongside it. It’s possible that since the majority of the rum drinking public outside Brazil knows little about the type, or because bartenders who nab a bottle or two of it frothed over its potential, that such claims can be made. As far as I’m concerned, it has a snazzy bottle, clean, clear design philosophy (so it looks real cool), and excellent marketing, which, when all is distilled down to what matters – the taste and how it drinks – just makes me shrug and move it to the mixers shelf, which is probably where it always belonged anyway. The Rio Olympics will surely revive interest in cachaças. Let’s head into the Amazon for a few reviews, starting with this delicate but ultimately disappointing one from Leblon. 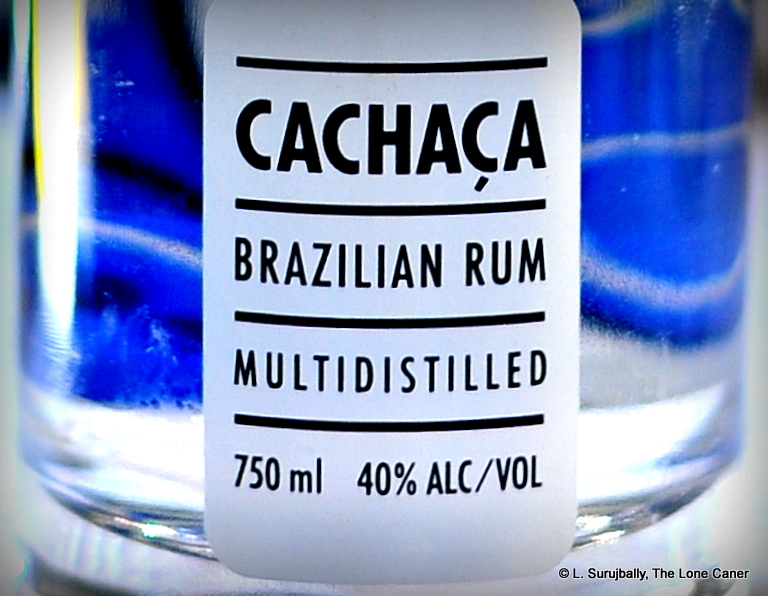 Cachaças, the rhums of Brazil, remain among the most unrepresented rums in the world, both from a perspective of being written about in reviews or info-blogs, or of actual knowledge of their incredible variety outside their place of origin. And yet supposedly some 1500 or so such rums exist (one writer says it’s 5000), far eclipsing the other cane juice minority of the agricoles, which get much more attention. Amazingly, a mere 2% of these rums ever get exported to the rum swilling public (most of them unaged whites), which makes Brazil the next great undiscovered country. Leblon is a cachaça produced off a French-style copper pot still at the Destilaria Maison Leblon in the Minas Gerias region of Brazil (it’s the huge territory north of Rio, and supposedly the premier region for the spirit in the country). The label speaks of light ageing, and the website says it’s in French oak barrels that once held XO cognac. Although not mentioned I’d suggest “light” means less than six months because the brownish tint to the rhum is well-nigh imperceptible and it just doesn’t taste like anything left to rest for an extended period. Like with most cachaças, the idea is not to drink it neat (though this was the basis of the review) but to mix it in the Brazilian national cocktail, the caipirinha, where, with their sunny optimism, the Brazilians usually remark “The worse the cachaça, the better the caipirinha.” Well, by that standard, this one must make a killer drink, because of the various cachaças I tried that day, this one came in picking up footprints. In 2009. a writer from WineCompass said “We have tasted several excellent cachaças over the past two years and Leblon is easily the best,” but I guess he and his fellows were looking for different things than I was. This was partly because of the excessive woodinesss of the nose. Cachaças may be aged in local timbers (and the Delicana rums, you will recall, indulged themselves in aging in some very peculiar woods indeed). This one was not just woody, but excessively so – it was like I just bumped into Treebeard’s backside. Yet, this is a cane juice pot still rhum, which is then filtered three times, so obviously that was a deliberate choice to have the woodiness so initially dominant. Anyway, pungent wax and resins and tree sap were the first scents I noted, a quick, sharp explosion of them…and then they were gone. Sugar water, extremely light fruity notes (a melange rather than anything clearly individualized) and bright green grasses after a rain. The smells got a little heavier over time developing an almost creamy heft of breadfruit and pumpkins and it was all a rather sharp, short experience, if intense for a 40% rhum. Unlike the Jamel and the Sagatiba cachaças which I tried together with this one (I’m going in ascending order of my scores), the sugar water taste of swank was mostly absent when I tasted it. It was again creamy warm solidity rather than light effervescence, medium bodied, hardly sweet at all (though I tasted something of a watermelon rind with some pink still clinging to it, and a lemon pip or two), and trended more towards a toned down tequila mixed up in an olive-based fruit salad from which most of the fruit had been removed. I should note that the woody tastes that started off the party were not evident on the palate…but came back to a raucous goodbye on the fade, lots of tree bark and the slight acidic bitterness of sap, mixed up with sugar water and fresh fallen rain on hot wooden planks. Summing up, all the markers of an agricole are here in this cachaça (although let me hasten to say I am not rating the Leblon against the white French island rhums) — the cane juice origin, pot still distillation; the spicy, sugar-water and watermelon tastes, but with that creamy taste which rubs up the wrong way against the lighter tartness of the barely perceptible fruit; and it demonstrates a peculiar Brazilian distinctiveness that marks it out as “not French.” In fairness, all sources are adamant that this is a rum to mix, not drink as a sipping juice, and I’d recommend it that way as well. It’s by no means a rhum you should try neat as your first sojourn into the spirit. If you’re into French island rhums, and younger, rawer, more untamed spirits, and love your cocktails, well, sooner or later you’ll come to cachaças, yes. But not necessarily this one. Josh Miller rated the Leblon at 7.5, and it was his fourth favourite of the fourteen he tried in his Cachaça Challenge in 2015. Leblon was acquired by Bacardi in 2015. If originality and straying off the beaten path of the rumworld is your thing, wander no further. The thing is just a few stops short of being stunning. This is one of the rare occasions where I tasted a rum blind, knowing absolutely nothing at all about it before I started…really, absolutely zilch. Not the country, not the company, not the distillate. I blame this on the pad I crash at in Berlin which has no wi-fi, no internet, no elevator, and what passes for hi-tech is an East-German era rotary dial phone. So the situation when I tasted this rum was kinda interesting, and allowed me to dispense with any preconceived notions and just tell you what it was like to drink. Short version? It isn’t half bad, and just a step removed from stunning. Before all that, let’s speak briefly about the company. L’Esprit is a French bottler and distributor based in Rennes, in the Brittany province of France. They do all the usual importation and distribution of old favourites from old countries (or islands) which we know better, but have also branched out into independent bottlings from all over the map – Barbados, Guyana, Panama, Guadeloupe, Nicaragua and so on, all uncoloured, unmessed-with, unadded-to. This is a column still cane juice product. Bottled at 47.7%, the rum (I’ll call it that, even though, y’know, it confuses me, and it may actually be a rhum….or not) was light yellow, one of 198 from the single cask, and matured between 1999 and 2012 in an ex-bourbon barrel: it’s a hair over thirteen years old. 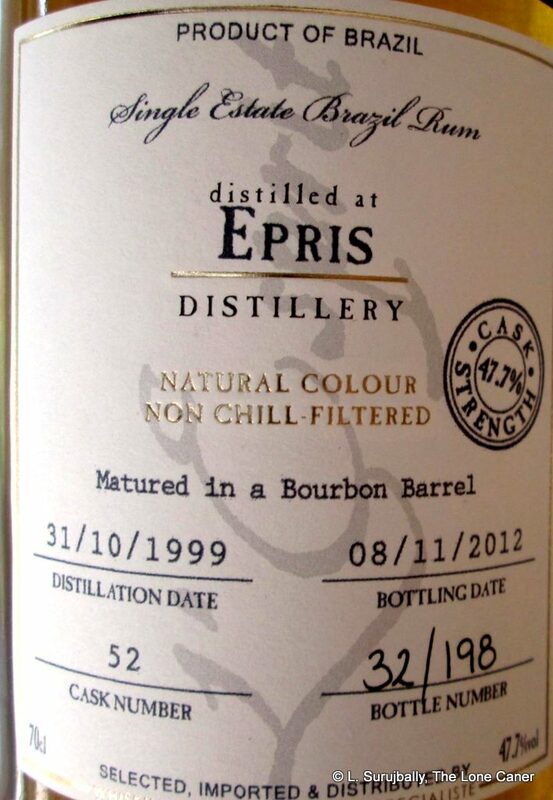 It’s not, strictly speaking, an original – Bruichladdich (Renegade) and Cadenhead have both issued rums from Epris before. Epris, for what it’s worth, is a distillery located just outside São Paolo in Brazil, and they apparently also distill for Bacardi (as usual, their website is massively uninformative on their product lines). Brazil may be something of an afterthought for L’Esprit (or not). Doesn’t matter. It’s great. There’s very little that’s wrong with the spirit, and much that they got absolutely right. Consider first the aroma: Vegetal, sweet and easy to sniff, quite warm. Initial notes of cardboard, creamy nougat touched with some lemon zest. There was a musty kind of background here, like dried hay in a sunlit field, but also the clean, crisp sweetness of a good Riesling. After a while additional notes of peaches, soft ripe mangos, green grapes and then the slight tartness of soursop, ginnips and green apples came to the fore. Really cool stuff, honestly. That slight lip-puckering tartness didn’t go away on the taste either, which I think was a good thing. It was oily and pleasant, a little fuller than the light yellow colour might have implied, and was both a little sweet and a little briny at the same time. The vegetal hay-like notes (complete with dusty dry hints) stayed along for the ride, with citrus emerging gradually from the background. Somehow the rum managed to balance both the creamier tastes of brie and toblerone with sharper citrus and soursop into a melange I quite enjoyed. With water these tastes came into fuller focus, but I can’t pretend anything new or more original came out, except perhaps some smokiness and well-oiled leather. The finish was also quite excellent – somehow L’Esprit managed to dampen down the sharper and more acidic citrus notes, and allow the deeper, fruitier closing aromas (plus a last surprising licorice hint) to take their turn on the stage in a fade of medium length which closed things off just right. All in all, it was just sweet enough, just strong enough, just fruity enough, just salty enough; and displayed a quality to both delight and impress. Clearing away the dishes, then, the rum had real character and originality, and I enjoyed it a lot – it was one of those samples that has sent me running around looking for more. I think that agricole aficionados would greatly enjoy it, and even traditional molasses rum lovers would have little to complain about here – L’Esprit have found an intersection of heavy and light, warm and sharp, fruity and tart aspects here, that left me admiring as hell, wondering if I shouldn’t get more into Brazilian products. In reviewing the Ron Veroes Anejo, I said of it that it should have had more edge, more oomph, more complexity, more daring. Here’s an example of the rum about which I was thinking. Sometimes a review is about more than just tasting notes, but illustrates a larger point about the rum universe. 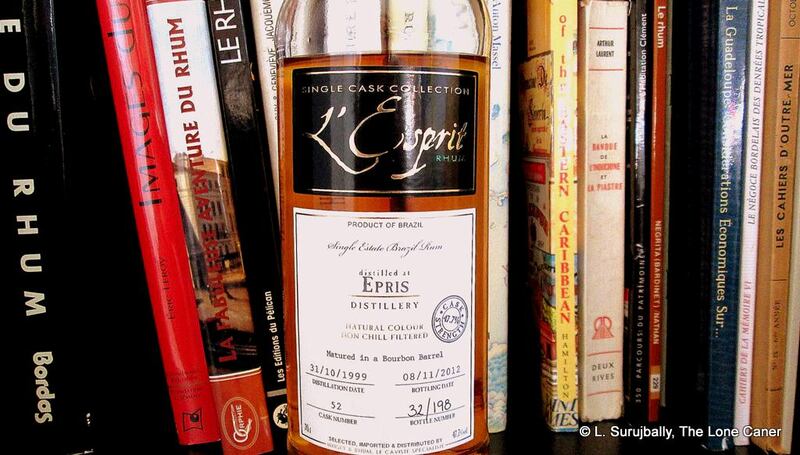 Since tasting the L’Esprit Epris, I’ve been left with questions that remain unresolved. It was made in Brazil, but aged in France, so is it a cachaca? An agricole? An aged red-haired love-child of both? Does ageing it that long make it less than either, or more? When you think about it, what it does, more – and perhaps better – than any rum I’ve tried in the last year, is tell us that we have to take a look at how we classify rum. It’s the exceptions that inform how good our rules are, and this one falls into no clear point in the current system. Perhaps it’s time to seriously examine the system.